I met this unusual guest recently. The photo came from a mobile phone as I was not ready for him. I have seen a few porcupines but this one was quite big. Hope someone can identify the exact specie. The specie was identified as Indian Crested Porcupine (Hystrix indica), thanks to Bushana. 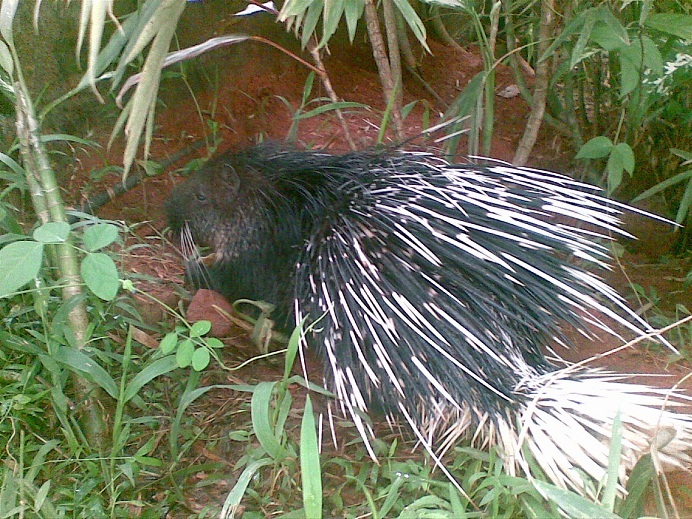 We have only one porcupine species in Sri lanka and that is Hystrix indica. that is indeed one very unusual guest. This the biggest I have seen. About 2.5 feet in length. Yep it is. He was not afraid of me staying that close. Thanks a lot for your comments. I hope you are alright and your family too.. I have not seen a real one before. Ohh! Looks like you got really lucky to see one out in broad daylight! Yes it is not a very common critter in our neihghbourhood. With all your travels you should have seen atleast one. So my conclusion is that there are none in Malaysia. Yes, I was quite lucky. I have seen a few before but never this close. Yes, they can be bit mean but this one looks very innocent. It sure is unusual.. :D I've seen them sometimes during long trips, like they're kept on roadsides, leashed and all. Probably for selling. It's sad to see them like that.. they should be freely wandering. Porcupine may grow up to about 79-96 cm with quails(i.e. Nearly one meter)Head and body only might be around 66-77cm. Good one. I have them in my garden, but difficult to see because of their mainly nocturnal habits. Hi There, Just thinking about you... Giving up blogging??? I miss you.. Hope you are doing okay. Yes, a very innocent creature, but farmers hate them. thanks for the information, that is huge! Yes, they dig holes like crazy.that is one way you can say that they live in a partiular area. This is a wonderful picture, especially since it was taken with a phone camera. I've never seen such a colorful porcupine before. The ones I've seen over here are mostly brown. Good work, thanks for sharing those nice images. I need that camera phone! It's a really good image! I have only ever seen one from afar. We have a different species back in Texas, as well as here in Goiás. Miss you!! We've both been MIA, lately. Hope to see more of you soon. Yes, bit MIA these days. The Porcupine was very special. Heard he is still seen around that place. Pretty lucky to come across one of them during the day. What a cute little fellow, but ouch! that quill skirt is longer than our porcupines wear. Ours are pretty docile creatures and move quite slowly. I guess they do not have much to fear. Yes this one has a long quill skirt. Look dangerous but actually he is a very innocent fella. Thnaks for your comments.